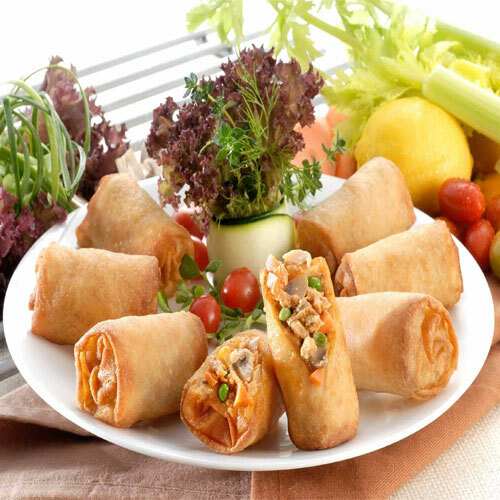 The vegetarian spring roll recipe is a classic Chinese dish made from homemade wrappers filled with stir fried vegetables. Spring rolls is enjoyed by everyone, children in particular. 1/2 cup plain flour (maida), 1/2 cup cornflour, 3/4 cup milk, 2 tsp melted butter, a pinch salt. Combine the plain flour, cornflour, milk, salt and 1/2 cup of water in a bowl and mix well till no lumps no remain. Grease a non-stick pan with butter, pour 2 tbsp of the batter into the pan and tilt it around quickly to make a 100 mm. (4") diameter thin circle. When the sides begin to peel off, turn the pancake and cook on the other side for 30 seconds. Repeat with the remaining batter to make 11 more pancakes. Heat the oil in a wok /kadhai on a high flame till it smokes. Add the spring onion whites, mixed vegetables, bean sprouts and msg and saute on a high flame for 3 to 4 minutes. Add the noodles, spring onion greens, soya sauce and salt and sautÃ© on a high flame for another 2 minutes. Divide the stuffing into 12 equal portions and keep aside. Place a panacke on a flat, dry surface and place a portion of the stuffing on one of its edge. Apply a little flour paste along the edges of the pancake. Fold the top edge over the mixture to seal it firmly. Fold the left and the right side of the pancake in order to get a rectangle. Roll the pancake downwards tightly sealing the ends securely with the flour paste. Repeat with the remaining ingredients to make 11 more rolls. Heat the oil in a wok/kadhai and deep-fry in batches till they turn light brown in colour. Cut each roll into 2 equal portions and serve hot with schezuan sauce.